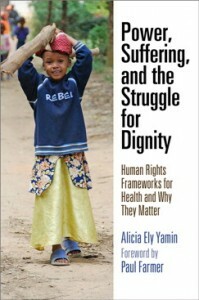 “Before I had my two children, I had a miscarriage.” This is how Alicia Yamin starts her new book Power, Suffering, and the Struggle for Dignity: Human Rights Frameworks for Health and Why They Matter. By introducing the book in such a personal manner, Yamin, the Policy Director of the Francois-Xavier Bagnoud Center for Health and Human Rights at Harvard University, prepares the reader for what is to follow. In interweaving personal stories, Yamin demonstrates how health should be situated as a human right and, in doing so, represents a major turning point in the struggle for dignity. The great challenge in studying broad concepts in matters with very real world ramifications is that the writing can feel distant and cold. To alleviate this concern, Yamin incorporates case studies from her vast experience working in the field. By humanizing these seemingly abstract issues, Yamin is not only able to hook the reader but also establishes a narrative voice that guides the reader through the book. At its best, Power, Suffering, and the Struggle for Dignity attacks the preconceptions and assumptions that have inhibited the implementation of a human rights framework for health. For instance, in the introduction Yamin cites the too-often-used phrase “there but the grace of God go I” in discussing a general apathy towards the issues on the part of those in privileged positions. By casting the inequalities in health and healthcare to divine providence, the real-world human decisions that have fostered and expanded inequality are easily dismissed or ignored. As a result, too many people unnecessarily suffer from indignity without intervention. These inequalities are often the result of discrimination based on race, gender, and poverty – issues that are beyond the control of those that don’t have access to health. Many of Yamin’s examples are related to maternal health and mortality. From the sexual, physical, and emotional abuse perpetrated by the men in her life to losing multiple children to AIDS and malnourishment, Yamin outlines how one particular woman had been denied agency throughout her life for no other reason than she lived in an impoverished region. The decisions that led to that poverty were well beyond her control – often made on the other side of the world – and yet we too often believe the myth that we all reap what we sow. In reading Yamin’s book, the reader is confronted with the fact that, despite our North American claims to individualism, we live in an inter-connected world. Adopting a collectivist mindset, which would accompany the de-commofidication of life, could go a long way in reducing suffering and allowing people to live with dignity. Too often, that is reserved for those in a position of privilege, which is why, as Yamin rightly points out, implementing a human rights framework for health should be a priority for governments around the world. In making this argument, however, there is an inherent risk of colonialism. In addressing this, Yamin notes that her case studies are based off her lived experiences. Despite the majority of her professional career taking place at Harvard University, she notes that she has lived half her life outside the United States, oftentimes as part of the communities with which she works. As an attorney, this was central to her legal work, but it also makes the book much more personal and enhances the argument. A great, if difficult to read, example of this comes early in the book as the first chapter discusses Yamin’s time living in Mixcoac, a working-class neighbourhood in Mexico City. The area had no washing machines at the time so once a week a woman and her daughter would come to do the laundry. This women would often discuss her abusive husband and how she was scared to leave, mostly because she could not support herself and her daughter on her own. When she didn’t show up for work one day, her family feared the worst. Her badly beaten body was found a couple days later and her daughter was never found. Despite the evidence against him, her husband was never charged. While this may seem like a judicial or domestic violence issue, Yamin situates this painful personal story as a health issue. If health were understood and situated as a human right, this woman would have been able to leave her abusive husband without fear of reprisals or being unable to provide for her daughter. Providing the social and cultural support for women and children suffering from abuse in the ‘private sphere’ is very much a public issue that can be helped by situating health as a human right. In a similar vein, pollution, poverty, and colonialism are all issues that we can examine through a human rights framework. This is what Yamin so effectively conveys in Power, Suffering, and the Struggle for Dignity. She clearly discusses the legal, social, and cultural issues that shape our understanding of health in an engaging and personal manner. The book is powerful in its use of first-person accounts without feeling exploitative, a difficult balance for any researcher of traumatic events. In this episode of the History Slam, I talk with Professor Yamin about the book. We talk about her personal experiences, defining human rights, and what constitutes health policies. We also talk about colonial mentalities and the challenges of combating the commodification of life.